AdrenoTone contains a selection of adaptogenic herbs that are of benefit during times of stress. 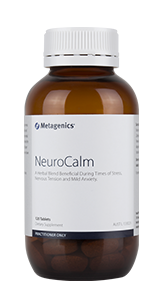 The formula enhances physiological function where there is reduced mental and physical tolerance to stress. 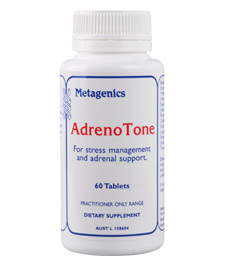 The herbs in AdrenoTone support the nervous system and have a tonic effect on the adrenal glands, thereby assisting in the management of normal adrenal health in patients who are exhausted due to chronic stress. Directions: Adults: Take 1 tablet three times a day or as directed by your healthcare professional. 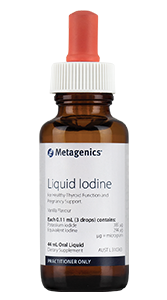 May improve stress adaptation: AdrenoTone may be beneficial during times of stress as it contains powerful herbal adaptogens to assist in mental and physical tolerance to stress. Siberian and Korean ginsengs are traditionally used as broad-spectrum adaptogens, and withanolides in withania have been shown to improve stress tolerance. Licorice is included as it has a long history of use as an adrenal tonic. 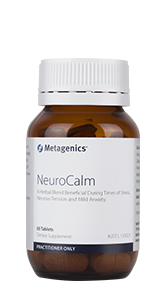 Rhodiola may reduce stress-induced mental and physical fatigue: Rhodiola has demonstrated potent adaptogenic activities in clinical trials comparable to Korean and Siberian ginsengs. This herb has traditionally been used to support normal, healthy moods and improve mental and physical fatigue in stressed individuals. In a human study, 20 days of administration of rhodiola provided a 50% improvement in fine neuromuscular control and 30% increase in mental performance. Supports healthy adrenal function: Korean ginseng has been shown to have a number of effects on the adrenal glands and their controlling mechanisms, optimising response to stress in both the short and long term. During prolonged stress, Korean ginseng exerts a glucocorticoid sparing effect, improving capacity to respond during times of stress. Additionally, rhodiola has been found to minimise the negative effects of chronic stress on mental function and physical endurance. 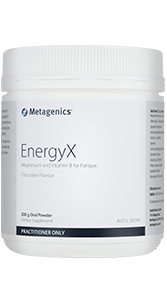 May improve energy levels in patients who are exhausted due to chronic stress: Withania has been traditionally used in Ayurvedic medicine for improving energy and vigour. Siberian ginseng has been shown to improve fatigue by supporting nervous and adrenal function. Korean ginseng has been found to boost energy levels during times of stress, and finally, through its role as a precursor to dopamine and the catecholamines, tyrosine can reduce the fatigue experienced during prolonged stress. Contraindications: Not for use in pregnancy. Cautions: Monitor blood pressure in patients with hypertension.